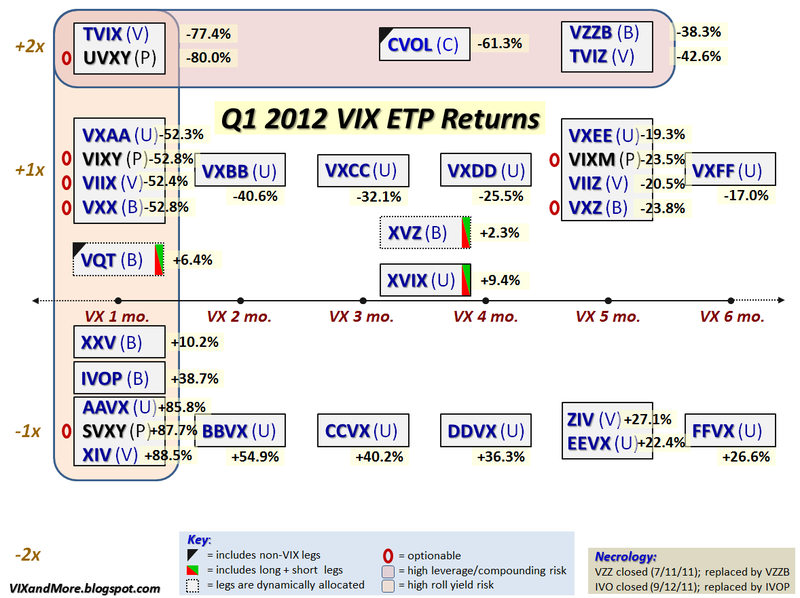 Getting back to the main point, the graphic below updates the VIX exchange-traded products (ETP) landscape (the only additions are two new red 0s to indicate that UVXY and SVXY are now optionable) and adds performance data for the first quarter of 2012. 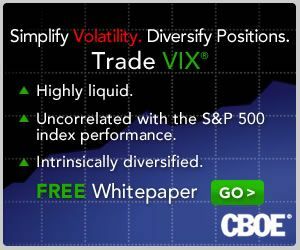 Of course anyone who has checked in on this space periodically certainly has already realized that the first quarter saw record contango and negative roll yield across the full spectrum of the VIX futures term structure. As a result of this, the long volatility products had a horrendous three months, the inverse ETPs racked up huge gains and those products with dynamic allocations (VQT and XVZ) or offsetting long and short volatility legs (XVIX) were able to manage small(er) gains. Following the usual pattern, the products with the shortest target maturities were the most volatile, while those with longer target maturities saw much less movement. Also notice the symmetry of the return structure. For all the long products that were getting whacked (TVIX, UVXY, VXX, TVIZ, etc.) there were corresponding inverse products (XIV, SVXY, ZIV, etc.) that were racking up larger gains than the losses suffered by their long volatility counterparts. Last but not least, perhaps the distribution of the returns will help to explain why I have organized my previous VIX ETP ‘field guides’ in this fashion. This graphic should implicitly raise a bunch of issues and the links below are good jumping off points for further exploration regarding a number of those issues. For the time being I will leave additional analysis to those in the comments section.